Battery of Leiden jars, used by Marconi around 1900. 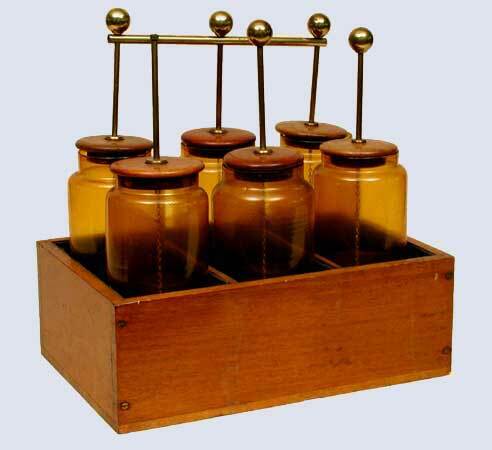 The Leiden jar, the first electrical capacitor, was invented in 1745 by Pieter van Musschenbroek, a professor of physics at Leiden University, and independently by the German cleric Ewald Georg von Kleist. The jar was made of glass, partially filled with water and contained a brass wire projecting through its cork stopper. An experimenter produced static electricity by friction, and used the wire to store it inside the jar. Without the jar, the electrified material would loose its charge rapidly to the surrounding air, in particular if it was humid. Van Musschenbroek arranged some spectacular demonstrations of the power of the device, in the course of which a student named Andreas Cunaeus was subjected to a prodigious shock. After having experienced the shock himself he writes, in a letter to his French colleague Réaumur, that the whole kingdom of France could not compel him to repeat the experience. The French priest Jean Antoine Nollet, a great popularizer of electrical phenomena, learned of the Leiden experiments via this letter and lost no time in contriving even more spectacular demonstrations. They culminated in one involving 700 monks joined in a circle to a Leiden jar! News of the Leiden experiments reached London equally quickly, where (in the same year 1746) they caught the attention of the versatile William Watson, physicist, physician, and botanist. He, too, set about repeating the basic experiments of Van Musschenbroek, improving the Leiden jar by coating its inside and outside with metal foil. In so doing, he observed a pattern of electrical discharge - namely, that a participant, like Cunaeus, tended to feel the shock 'in both his arms and across his breast'. It suggested that a single 'electrical aether' or fluid is transferred, but never created or destroyed, from one body to another only when one has a surplus and the other a deficit of electrical aether. The name of this ingenious device lives on today in the society of physics students at our university, which is called 'De Leidsche Flesch'. For an artistic view of Leiden jars, see Katherine Luna's Inspiration. In his 1875 science fiction classic "Twenty Thousand Leagues Under the Sea", Jules Verne imagined an undersea hunting expedition that used Leiden jars as bullets (socalled Leiden balls). Many of the scientific instruments developed by the brothers Pieter and Jan van Musschenbroek can be admired in our science museum, the Museum Boerhaave. source: Per F. Dahl, Flash of the Cathode Rays (Institute of Physics, Bristol, 1997).